This makes a fastener-free, 3″ wide belt that will hold a few essentials safely while you are running or undertaking any other type of exercise involving pocketless clothing. It’s suitable for men or women and can be worn around the waist or hips, as you wish. You just pull it over your head to put it on. 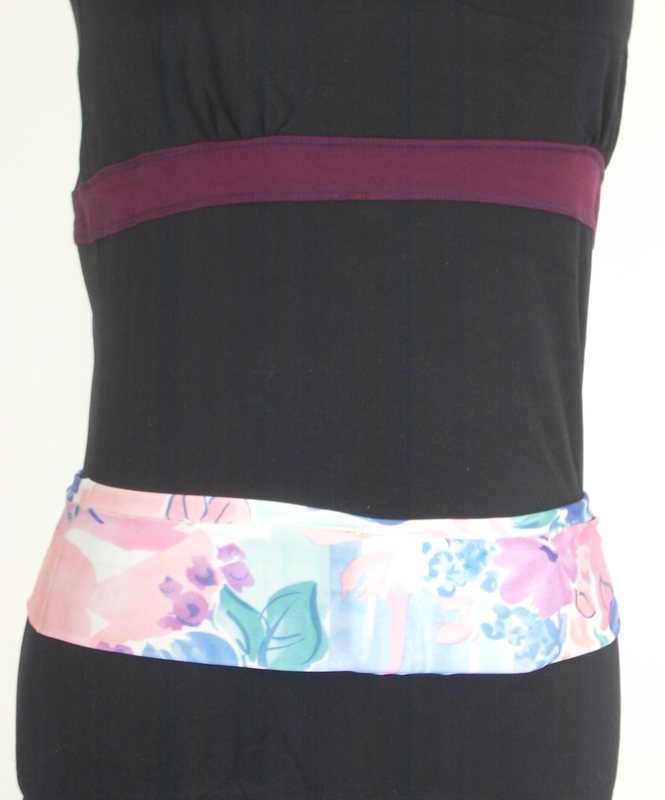 The stretchy fabric means the belt lies snugly against the body and the contents don’t bounce around. It’s very comfortable to wear. You’ll need a Lycra/Spandex jersey (ie knitted) fabric that will stretch in both directions, and by at least 25% in one of them. Cut a strip 8″ wide and about the same length as your hip measurement, you can always shorten it later if you decide to wear the belt around your waist. If the fabric is stretchier in one direction than the other, it’s usually across the width which is fine because the stretchier direction needs to be parallel with the long edges. Now fold the fabric lengthwise (long edges together). Try it around your body over your normal sports clothing and see if you can come to any conclusions as to approximately where you will wear the belt and how long it needs to be. It should be stretched so that it fits quite snugly around your waist, hips or somewhere between, or it will tend to slip in use. But if you are female and possessed of an hourglass figure, a belt that sits on your waist may be too small to get on and off without a struggle. Decide where you want the pocket openings and how large they should be. Two openings at the front and one or two at the back seems about right, spaced either side of the centre front and centre back but not too close to the sides. Don’t position the rear ones near to the ends either because you need to leave room for the seam. As for size, think about what you want to put into the belt. 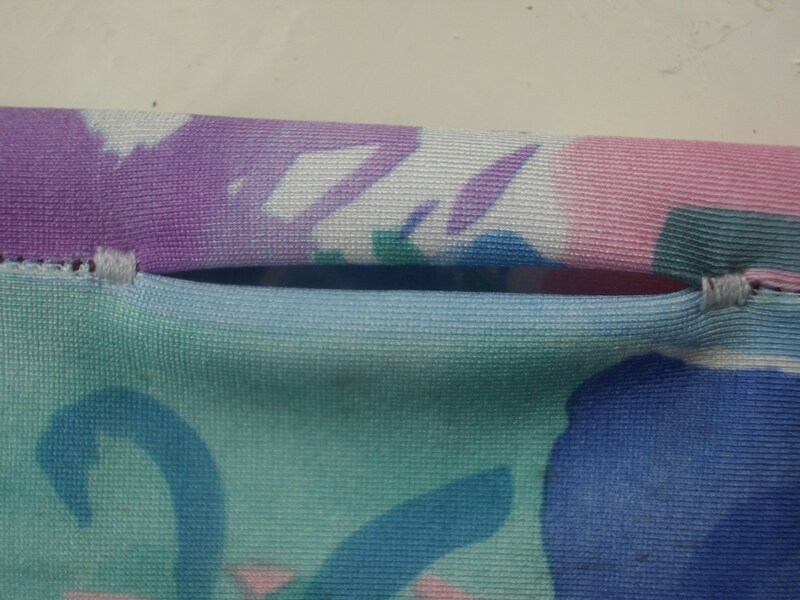 My phone is 2.5″ wide and the fabric is very stretchy, so I made my largest opening just over 2″ long. That’s also a suitable size to take a credit card or a pair of sunglasses. The other openings in my belt are smaller to accommodate keys, tissues, an MP3 player, a few coins, etc. You don’t need to worry about how to divide the belt up into separate pockets at this stage. Fold the fabric lengthwise (long edges together) with the right sides inwards. Use paperclips to hold the edges together. Mark where the stitching needs to stop and start to create the openings you want, using a ballpoint pen in the seam allowances. Try out the stretch stitch you plan to use on a scrap of fabric and check that the fabric still stretches by the same amount afterwards. Then sew the long seam taking a 1″ seam allowance (which forms the flaps), stopping and starting to create the pocket openings. If you have a walking foot, using it will help to stop the two layers moving in relation to each other. Once you’ve checked that your phone and other important items will fit through the relevant openings, finish off all the thread ends securely. 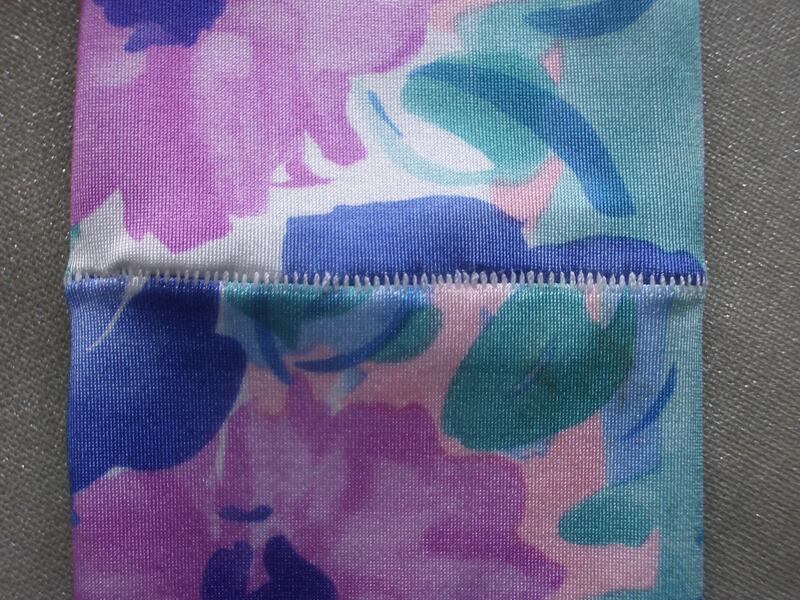 There’s no need to oversew or otherwise neaten the raw edges, swimsuit fabric doesn’t fray. Press the seam allowances open with a cool iron, then trim one of them to half an inch. 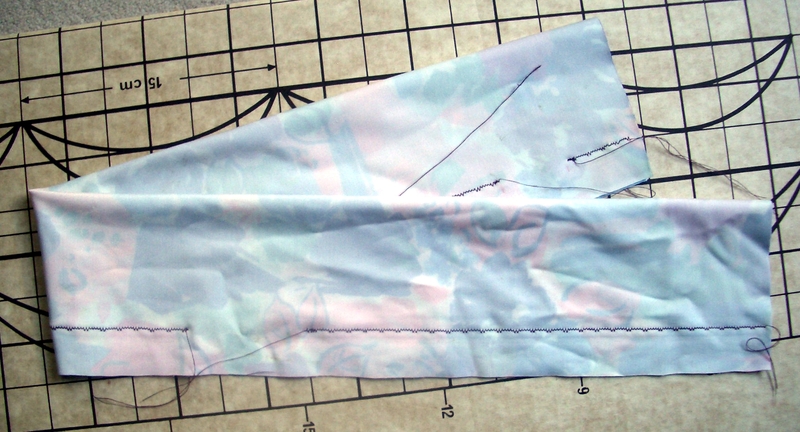 (If your fabric has a directional design on it, this is the seam allowance that will be pointing upwards on the finished belt.) Now turn the belt right side out, taking care to keep the seam allowances open, and reinforce each end of every opening by stitching with a short zigzag stitch. It won’t be easy to do this without catching in the opposite side of the belt, but it is possible with care. Finish off these thread ends. It’s not necessary to topstitch around the edges of each opening to hold the seam allowances in place, but you can if you want. Try the belt on again, holding the ends together, and make your final decision as to how much of a seam allowance to take when sewing the centre back seam. Turn one end of the tube back on itself, as if you were turning it inside out, but stop half way with the raw edges together. Line up the existing seam so that the seam at one end of the tube is on top of the seam at the other end, with the seam allowances open and lying flat. 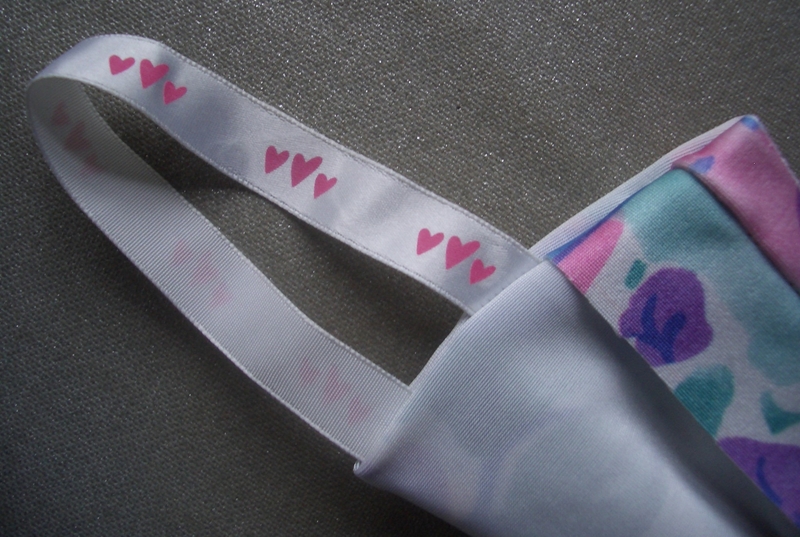 Then sew the centre back seam, all the way around the circumference of the tube. 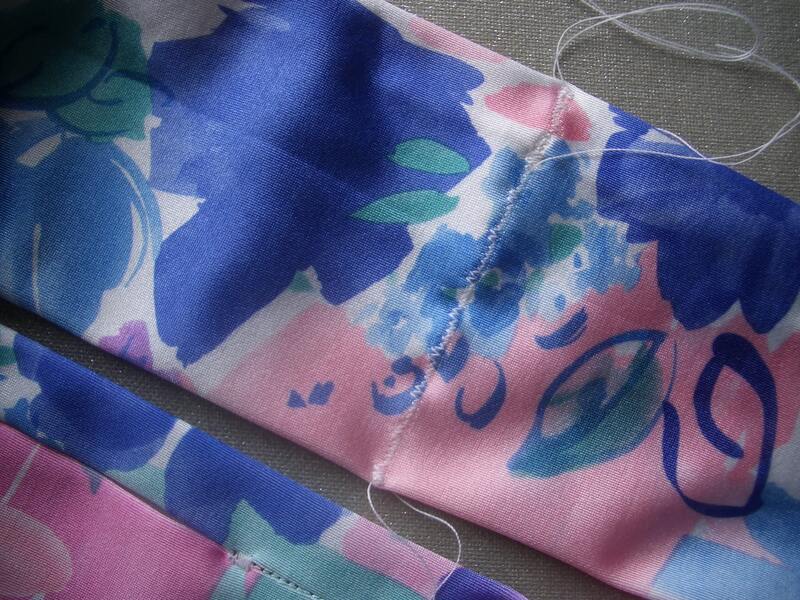 Trim the seam allowance to about ½” and press the seam open. Turn the belt to the right side through one of the pocket openings. Position the long seam so that it’s ½” below the top edge of the belt – in other words, so that the fold line runs along the edge of the seam allowance that was trimmed. At this point you could stop, but it’s advisable to divide the belt into two pockets by stitching through both layers at the sides. This helps to keep the seam allowances/flaps in the right position and also provides an opportunity to attach a tape loop, or a dog lead clip on a piece of tape or elastic, to secure small items such as keys inside the belt. I don’t think I will need this very often and I don’t want a hard clip against my body, so I opted for a simple loop made from about 6″ of ribbon sewn into a side seam at each end. I can slip a lanyard through this loop if needed, or clip a keyring to it. To use the belt, put it on with the opening slots on the outside and at the top of the belt. When you put things into it, push them along the pocket, away from the opening, and tuck the larger and heavier things (like a phone) under the edge of the lower seam allowance/flap so that they are held there and can’t fall out. Any excess length in the earphone cable from your MP3 player or phone can be tucked inside the pocket so it doesn’t flap about when you run.